“The EIB, as the EU Bank, is committed to supporting investment in Africa that unlocks economic opportunities, creates jobs and tackles a changing climate. As one of the largest multilateral financial institutions, the EIB has a crucial role to play to help channel private capital towards the energy transition. This is urgent if we want to achieve the Paris Agreement and the Sustainable Development Goals. 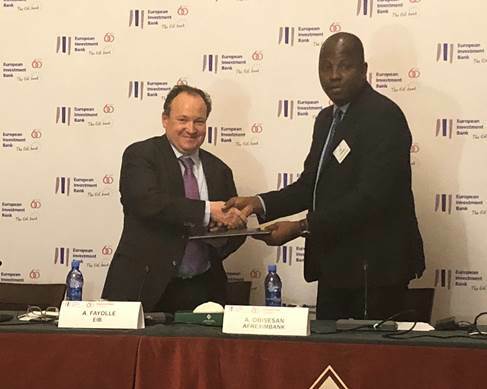 With this operation Afreximbank and the EIB are joining forces to improve access to clean energy across Africa”. We are confident that effective implementation of this facility, which heralds Afreximbank’ s financing of climate action projects in Africa, will lead to strong development outcomes, including employment creation, increased economic activities, and increase in tax revenues for fiscally strained governments,” said Prof. Benedict Okey Oramah, President of Afreximbank. According to him, Afreximbank decided to conclude the facility in furtherance of its current strategy which prioritizes Intra-African trade; intra–African investments, industrialization and export manufacturing of the labour intensive type.